H. Richard Sherman and John at the workbench. After I finished reading that letter I felt pretty excited. In retrospect I have to say that it was John's special nature and open style that gave me confidence to make that trip across the herring pond, which in turn gave my rodmaking a very significant boost. There was no keeping secrets or putting the proverbial veil of mystery over bamboo rodmaking--something I experienced all too often here in Germany. The fact alone that John Bokstrom had the idea of starting a bamboo rodbuilder's meeting--something that had never been done before--makes him an outstanding figure in bamboo rodbuilding and tells a lot about his character and attitude. Communication and free exchange of ideas among rodbuilders was the goal and he surely succeeded. It also brought him high recognition and he made many friends in Canada, the U.S. and in the rest of the world. In late April 1992 I arrived at Vancouver International Airport, after my very first trip on an airplane. After only a few hours sleep, getting scared to death by an earth quake at home, a 10 hour flight and another 1 3/4 hours from the airport to John's house in Maple Ridge, I felt pretty wiped out. When I was finally sitting in his living room, sipping a cup of coffee, talking about the trip, about my latest rodbuilding projects and so on, I felt really happy that I decided to make the trip. The heartfelt hospitality and friendship I received from John and his wife Joy immediately made me feel at home. Meanwhile I feel like being a family member. Besides that, I am about descend on him once again for the Year 2000 bamboo rodbuilder's meeting. I haven't missed one since 1992. During those following days in April 1992 at John Bokstrom's house I learned a lot about his rodbuilding, the kind of fishing he does, I met the rest of his family and a number of his good friends as well. Besides himself, his wife Joy told me quite a bit about John and what he did in the past. I was amazed about all his activities, his rodbuilding related achievements as well as the non-rodbuilding, so it is time to share it with you. 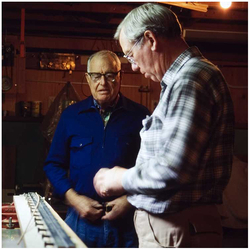 He not only started the Corbett Lake meeting, but in 1973 he was one of the founders of BCFFF, the British Columbian chapter of the Federation of Fly Fishers. He became BCFFF's first chairman and organized it to be a unified political voice for fly fishing clubs and fly fishers in British Columbia. In 1979 he was responsible for a freshwater angling survey. The results of that survey finally made the B.C. Fish and Wildlife Department realize how popular fly fishing actually is. This significantly changed the authorities assessment of the economic value of sport fishing and its impact on tourism and other industries in B.C. Apparently they were not aware of that! One tangible result was that more fly water became available.